Q1. What does the CCF project propose with respect to Italy ? A1. To issue each year 200 billion in CCF, which are monetary government bonds. Q2. What does “monetary government bonds” mean ? A2. The Italian government will not reimburse CCF. Rather, starting from two years after their issuance, CCF will be unlimitedly accepted to fulfill financial obligations towards the Italian state, including taxes, public pension contributions, national health system contributions etc. Such payments will be indifferently and validly made either in euros or in CCF. Q3. Are CCF an equivalent of money ? A3. They are deferred Italian money. Q4. Why the two years deferral ? A4. Because when they will be used, CCF will ceteris paribus reduce Italian governmental euro receipts. The deferral allows the Italian economy to recover and to generate higher tax receipts, which will offset this. Q5. Who will receive the CCF ? A5. Private enterprises, workers and the State itself. Proposed breakdown is approximately 80, 70 and 50 billion respectively. A6. …they will be bestowed CCF based on their labor costs. Eg a company paying 100 euros in total labor costs (gross of taxes and social costs) will receive 20 in CCF. This for lower salaries; for higher compensation levels, the CCF weight on gross salaries will be much lower, based on a layer mechanism. Q7. What about workers ? A7. Again, an employee with a 100 salary (net of taxes in this case) will receive 20 in CCF (much less for above average salaries). Q8. Enterprises and workers will then receive free of charge a significant amount of CCF, of “deferred money”. What will they do with that ? A8. They will either wait two years and use them upon expiration to pay their taxes or whatever they will owe the government, or they will convert them into cash (ie into euros) before expiration. Q9. How will the conversion take place ? A9. CCF are just a new category of government bonds. At the end of the second year following the introduction, there will constantly be 400 billion of CCF outstanding. An active and liquid market will develop. Q10. How expensive will be the conversion ? A10. The market price will imply a financial discount, presumably similar to the one applicable to a zero coupon two-year bond. It should be noticed that a CCF is safer than an Italian government bond. Q11. Why is it safer ? A11. The Italian government might default on a euro debt obligation. CCF will retain their value even under a default scenario – as the owner will have the ability to use CCF to pay taxes or whatever is due to the state. Q12. Who will buy CCF ? A12. The ultimate buyer will be somebody who has to fulfill taxes or other financial obligations towards the Italian state. Q13. Why 50 billion will be further bestowed to the Italian state itself ? A13. To put in place further actions to support demand, including supplementing income to financially distressed families, improving the National health system, speeding up payments of overdue bills to government suppliers, rebuilding parts of the country affected by earthquakes, etc. Q14. Why does the project call for issuing 200 billion in CCF annually ? A14. Because the financial crisis and the eurocrisis caused a huge output gap to Italy. Q15. How big is the output gap ? A15. Assuming the potential GDP growth to be 1.5% per year and further assuming that in 2007 Italy was at full employment (both conservative assumptions) the output gap currently is € 300 billion. A16. This is because a multiplier effect – more demand will stimulate more production and income, thus further demand – is expected. Q17. What is the rationale behind the 200 billion breakdown - private enterprises, workers and the State itself being assigned 80, 70 and 50 billion ? A17. The actual breakdown will be a political decision. Having said that, a key point is the size of CCF bestowed to private enterprises. A18. Because Italian unit labor costs must be realigned to Northern eurozone countries’. 80 billion is approximately 18% of total Italian private enterprises labor costs. Q19. Which realigns Italian competitivity with Germany ? A19. Yes it does, as effectively as a currency realignment (which implies breaking up the euro) would. A20. …as supporting Italian demand would otherwise imply increasing Italian net imports and creating a permanent trade deficit. A21. …increase Italy’s net exports, which will offset higher imports due to the economic recovery. Q22. Will Germany be negatively affected ? A22. No, because Italy will increase both exports and imports (including from Germany). The total effect is approximately neutral as concerns both Italian and Germany trade balances, as both countries will expand imports as well as exports. Q23. Will the Italian public debt keep on being euro-denominated ? A23. The existing one will. It is recommended to refinance the euro public debt, upon expiration, by issuing further CCF – ie refinancing the public debt with monetary instruments, which do not carry any default risk. This will make impossible for the 2011 sovereign debt crisis to occur again. Q24. 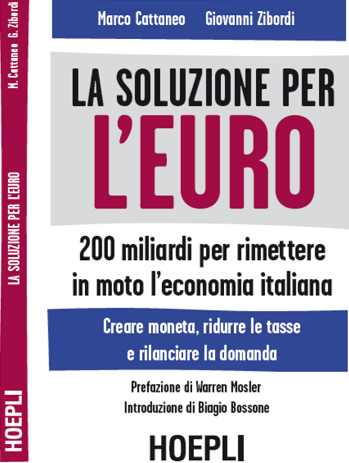 Do the CCF – the 200 billion issued on an annual basis – increase the Italian public debt ? A24. No, since CCF are not debt. They are money. There is no obligation to reimburse them. Q25. What do you expect as a reaction from European authorities, eurozone partners, and the financial markets ? A25. The CCF project makes the euro monetary system sustainable without implementing a transfer union and without breaking up the euro. Nobody asks for any money to Germany, and no Italian financial asset is converted in a weaker, newly introduced currency. Q26. Do current treaties, particularly the fiscal compact, need to be modified ? A26. As it is today, the fiscal compact is inapplicable. On the other hand, Germany pushed for it out of concerns of having ultimately to assume responsibility for Southern eurozone debt. The CCF project has the capacity to trigger a strong recovery and to make the South solvent. Q27. What does make the fiscal compact inapplicable ? A27. It calls for a reduction in the public debt / GDP ratio which is just too quick to be implemented. Italy should continue to raise taxes and / or to cut public expenditures, year after year, causing the GDP to further drop, which is self-defeating in terms of compliance with the debt / GDP reduction targets. Q28. So must the fiscal compact be repealed ? A28. Yes, unless it is accepted that CCF are not debt (which is true). Based on this and taking into account the possibility to issue “refinancing CCF” as the current debt gradually expires, the public debt / GDP ratio can be quickly reduced. This would be a huge positive both for Italy (which will become independent from financial markets’ gyrations) and for Germany (which will have no further concerns with having to pay for Italian debt). Q29. Do CCF risk producing inflation ? A29. The CCF project triggers a powerful recovery, but this does not create inflation risks as unemployment and unused production capacity are currently very high in Italy. No inflation risk exists as long as a significant output gap is still there. Q30. Why do you prefer the CCF project to breaking the euro up ? A30. Because it can be openly and properly discussed and does not imply any risk of taking place disorderly and of creating panic, bank runs etc. Because Germany is not forced to abruptly revaluate her currency. Because no financial asset where an Italian resident is the debtor has to be written down. Because no redistribution effect takes place and no litigation arises. Because Italian citizens’ savings are not suddenly converted into something different, that is worth less. Q31. Should the CCF project be adopted in countries other than Italy ? A31. It should, in each eurozone country which currently suffers from a significant output gap, particularly if this is associated with lower competitiveness (ie higher unit labor costs) than Germany’s. Allocations of CCF will, of course differ by total amount and breakdown, depending on each country situation. Q32. Will CCF evolve and become the circulating national currency ? A32. The CCF project will work even if CCF are not used for daily transactions. Having said that, exchanging them via credit cards or other electronic supports is a possibility. Presumably labor contracts, rents, real estate transactions etc. will increasingly be CCF-denominated. It is conceivable that, a few year from their introduction, CCF will actually become the national currency in the adopting countries, while the euro will be used as a unit of account and in some international financial transaction (such as was the case with the ecu). Ottimo grazie - questo post verrà citato e "linkato" in un articolo di Biagio Bossone, in uscita a breve su voxeu.org. Oggetto dell'articolo, proposte di politiche di sostegno della domanda supportate da espansione monetaria, adottabili nell'ambito del sistema euro. Segnalo il link appena esce l'articolo, dovrebbe essere entro pochi giorni. Molto interessante. E' poi uscito l'articolo su VoxEU? Grazie ! Avrò molto piacere se mi fai avere i tuoi commenti. Segue con molto interesse i tuoi interventi e articoli. Vedi ad esempio il post del 28.8.2014.
this is very essential Tax Credit Certificates quiz information to aware with us thanks for giving this post represented with us. GECOFE: iniziativa "Io ti voto se..."